Leslie Newman made her professional debut at the age of eighteen with the Toronto Symphony Orchestra, performing Carl Nielsen’s Flute Concerto under the baton of Sir Andrew Davis. She was subsequently featured as soloist with the Toronto Symphony at the Calgary Winter Olympics Arts Festival. Following studies at the University of Toronto, Yale University and Juilliard, Leslie settled in England, where she presented solo BBC Radio broadcasts from almost every major centre, including the world-famous Wigmore Hall. Since her return to Canada, Leslie has presented recitals across the country with numerous national and regional CBC broadcasts. 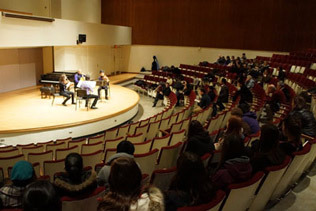 International recital engagements include at the Phillips Collection in Washington D.C., the Dame Myra Hess Concert Series in Chicago, Taipei’s National Concert Hall and the National Museum in Bogotá, Colombia. As concerto soloist, she has performed with orchestras throughout Canada. 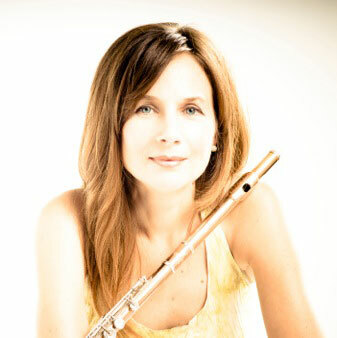 Leslie has performed as guest Principal Flute with the Hallé Orchestra, Bournemouth Symphony, BBC National Orchestra of Wales, National Ballet Orchestra, Canadian Opera Company Orchestra and Esprit Orchestra. She has toured through Brazil, Argentina, Japan, Europe and the U.S. with Sir Simon Rattle and the City of Birmingham Symphony Orchestra. Recent performances include a Koerner Hall appearance as featured soloist in Kaija Saariaho’s Terreste, with subsequent concerts in China and Taiwan, concerto performances with the Hamilton Philharmonic Orchestra, and concerts with the Amici Chamber Ensemble, the St. Lawrence String Quartet, at the Royal Conservatory of Music’s inaugural 21C Music Festival and at the Toronto Summer Music Festival.